Just when we thought we’d did everything we could to prepare our college students for the financial responsibilities that come with owning credit cards, we learn that far too many have no idea what the basics of credit are. There’s a new set of facts – and if you have teens, you might be surprised at what they don’t know. What happens when you make a late payment on your credit card? The overwhelming majority – 76% – admitted they had no idea. Worse, they have no idea how devastating those late payments can be on their credit – and if they’re readying themselves for life after college, there will be more than a few rude awakenings in their future. The Federal Reserve reports a decrease in the number of new credit card accounts opened in a college student’s name. A drop of 17%, in fact, in the year after the CARD Act went into law. Remember, credit card companies are now prevented from aggressively marketing their wares to college students by showing up on campus and offering free swag just for applying. Not only that, but college students are no longer allowed to open up credit card accounts unless they can provide some type of proof of income. But there are those who do have credit cards, either because they applied before the law went into effect or because Mom and Dad cosigned. 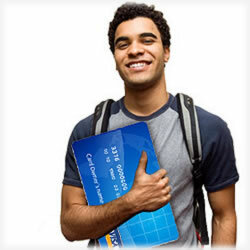 Of those college students with credit cards, 34% have one and another 37% say they have more than one credit card. Remember – 76% of them admit they have no idea how a late payment affects their accounts or their credit reports. Only 14% know the interest rates associated with their credit cards and just less than 30% know late payments mean late fees being tacked on to their card accounts. 36% say they use their cards less than five times a month. 13% say their use their card more than once a week. 1% say they use their credit cards multiple times in a day’s time. 90% don’t pay their balances in full each month. And if you’re wondering how some college students justify using their credit cards for reasons other than emergencies, most said they were already going to graduate with student loan debt, so what more harm could come from a $1,000 credit card balance. What they didn’t know, however, was that $1,000 was growing on a daily basis, due to interest and possible APR increases, late fees and other fees they’re responsible for. Meanwhile, Sallie Mae, the largest provider of student loans in the United States, conducted a study that looked into spending trends of today’s college student who possesses at least one credit card. What that research found was that spending with credit cards is still a concern for most families. Many college students are maxing out their credit cards and they’re doing with often within their first year on campus. Sallie Mae says it’s at epidemic proportions. Of course, they aren’t thinking long term (and really, many of us weren’t thinking long term at that point in our young lives, either). It’s difficult for parents to make them understand just how long these decisions will affect them, especially if they’re unable to maintain their payments. Parents that teach their children responsible credit use, along with good money management, send their children off prepared to handle their own finances. And here’s one bit of information many parents don’t even consider when they’re looking for resources: MasterCard, Visa and American Express have websites that are designed to teach college students the importance of responsible financial habits. If parents can find a way to teach responsible budgeting, many counselors say it will provide that sold foundation that will make it easier for parents and their college students to bridge those differences. Even a one hour investment at the dinner table can make a world of difference, especially if you’re preparing budgets, defining responsible credit card use, the importance of not maxing their cards out and that paying down their debit in a consistent manner can be one of the wisest investments a parent can make in his son’s or daughter’s lives. Parents should reiterate the importance of keeping communication lines open and the importance of saving. College students might find that challenging, but if those habits are put into place early on, it’s going to do justice in their lives later on. A lot of this could be changing in the coming months, courtesy of the Consumer Financial Protection Bureau. Currently the government watchdog group is seeking public input on several aspects of credit and college students, including how current and future partnerships or other arrangements between colleges and financial institutions – including credit card companies – can be better structured to promote better decision making skills when it comes to credit and good cash management habits. And then there’s the proverbial white elephant. There’s close to $1 billion in Perkins loan defaults in the U.S. These loans are reserved for low income applicants. Unfortunately, due to a weak economy and even weaker job market, some colleges, including Yale, George Washington University and Penn State, are now suing those one-time students. Not only that, but when defaults start hitting numbers this high, the programs are quickly put into jeopardy. If there are no funds to provide college students, it defeats the purpose. One year ago, there was $964 million in defaults. This illustrates perfectly the growing hardships college students face after graduation. Another unique characteristic of Perkins loans is that they’re actually administered by the colleges. Let’s not forget, either, that President Barack Obama says he intends to further expand access to college for working class families and increase funding for the Perkins program. If he gets his way, these specific loan products will increase to $8.5 billion from about $1 billion. The Education Department would service the loans instead of colleges. For now, though, teach your kids before they’re packing up for college the importance of never getting too close to their credit lines, the “money” is not free, the interest rate isn’t cheap and the attitudes they have now can determine how healthy they are from a financial aspect, years from now. Parents should remind their offspring often that carrying a large balance is sure to result in a domino effect that will be hard to stop. Between the lack of adequate financial education, many are saying it was just a matter of time before the perfect storm was born and it now appears it’s here.